San Diego’s City Council will have three new faces, if current election results hold, after two Council incumbents came up short in their re-election bids. Before Tuesday, an incumbent City Council member hadn’t lost in 27 years. Now two might be out in one election. Councilwoman Lorie Zapf’s loss to Democrat Jen Campbell will flip District 2, covering the beach communities of Pacific Beach and Ocean Beach, from red to blue, thereby giving Democrats a 6-3, veto-proof majority. That will be the big takeaway for many in City Hall, who now have to adjust to the Democrats’ newfound leverage over Republican Mayor Kevin Faulconer in his final two years in office. The other potential incumbent loss won’t result in a party change, but may be more shocking. 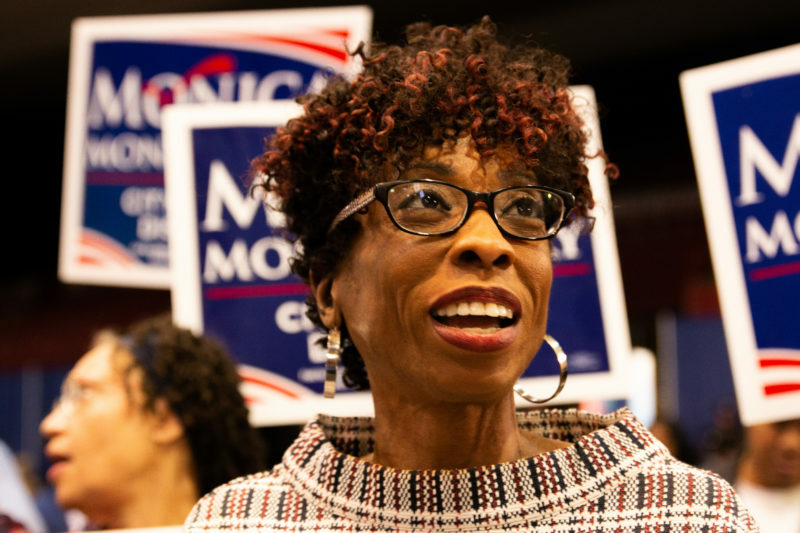 Democrat Monica Montgomery has a 5-point lead over her former boss, Council President Myrtle Cole, whose re-election bid had the support of the Democratic Party, organized labor and Faulconer. Montgomery’s win, after labor lobbed last-minute attacks against her, should send a message to outside interests not to meddle in District 4’s affairs, community leaders in the southeastern neighborhoods told Andrew Keatts. Labor also delved into the race to replaced Councilman David Alvarez in District 8, which includes San Ysidro, Otay Mesa and Barrio Logan. The party, labor and most elected Democrats sided with San Ysidro School District member Antonio Martinez, but Alvarez staffer Vivian Moreno had a 5.5 percentage points lead early Wednesday. As the new Council – and a new political dynamic in City Hall – takes shape, one incumbent who won his re-election bid, Chris Cate, said he isn’t hopeful that the Council will figure out how to work together. He said that’s based on comments one of his new colleagues made publicly. He wouldn’t say what that referred to, but Campbell told the Union-Tribune that she does not respect Cate. Voters have handed San Diego State University a giant gift but also a giant challenge, writes Scott Lewis. Results early Wednesday showed “yes” on Measure G with more than 55 percent of the vote. In contrast, more than 70 percent of voters picked “no” on Measure E.
Measure G is just the beginning, though, of a complex, unprecedented negotiation between the city of San Diego and SDSU. By the bare language of Measure G, it appears as though the city is mandated, if not required, to sell the land to the university. That would seem to leave the city without much negotiating leverage. Lewis reports that City Attorney Mara Elliott still thinks Measure G is illegal because of the way it ties the hands of the city’s elected leaders. But she also reports that she will not ask the City Council to take it to court. There were some contests that were too close to definitively call Tuesday night, but the race for District 4 county supervisor wasn’t one of them. Years after being battered by attacks from the left and the right, Nathan Fletcher is poised to become the sole Democrat on the county Board of Supervisors. Results posted early Wednesday showed Fletcher pulled in nearly 25,000 more votes than Republican challenger and former District Attorney Bonnie Dumanis. Progressives and labor leaders rallied behind Fletcher’s campaign and have high hopes for him. But as Lisa Halverstadt explains, Fletcher won’t have an easy time as the sole Democrat on a county board long led by Republicans. For the next two years, Fletcher could simply be an outspoken outsider or manage to occasionally persuade his colleagues to cut deals with him. One of the most surprising election calls Tuesday came from Rep. Darrell Issa – and it turned heads because the outgoing congressman made it first thing in the day, just as people were beginning to vote. Issa told Fox News early Tuesday that Democrats would pick up his seat – a surprising move, given that he’d endorsed Republican Diane Harkey, then seemingly admitted on Election Day that she had no chance. 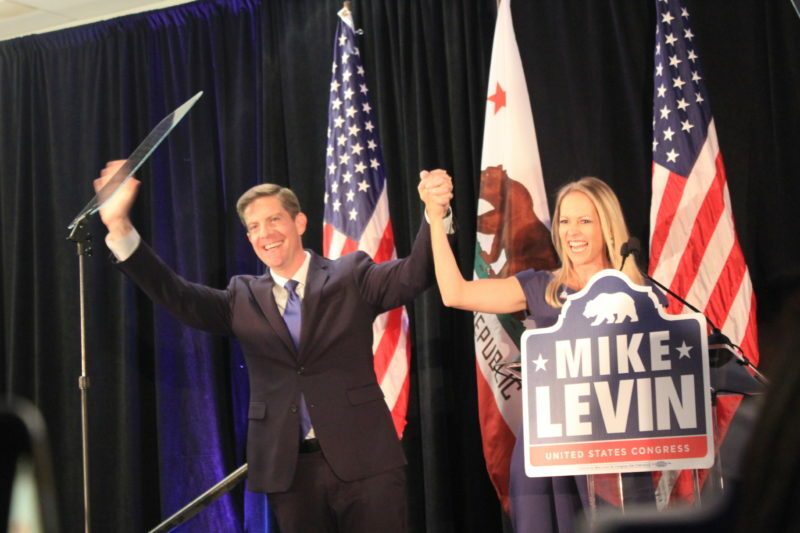 In a speech at the Hilton in Del Mar on Tuesday night, Democrat Mike Levin said he’d received a congratulatory phone call from Issa, who’s represented the 49th Congressional District for nine terms. “Our country has rediscovered the Democratic Party and the Democratic Party has rediscovered its voice,” Levin told a crowd of supporters. By midnight, Levin was about five percentage points ahead, with 44 percent of precincts reporting. Few would have predicted years ago that the 49th Congressional District, a traditionally conservative region between Orange County and Del Mar, would change hands. Fueled by activism in the wake of President Donald Trump’s election and shifting demographics, Levin helped build and sustain a level of Democratic support rarely seen in North County. San Diego Superior Court Judge Gary Kreep, best known for birther conspiracy theories about President Barack Obama and for being on the receiving end of a “severe public censure” in 2017, lost his re-election bid to Matt Brower, a deputy district attorney. 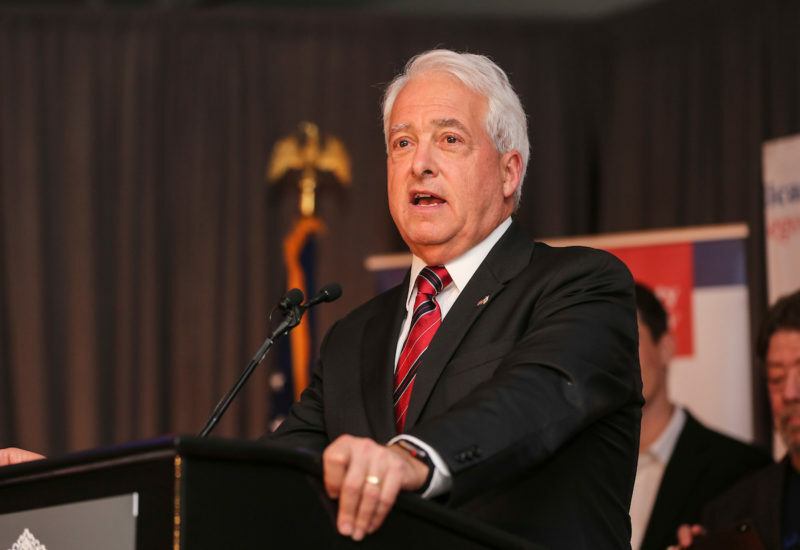 John Cox, a San Diego businessman and the Republican candidate for governor, gave his concession at the downtown US Grant Hotel. He railed against special interest money pouring into the campaign of his Democratic opponent, Lt. Gov. Gavin Newsom, now the state’s governor-elect. But Cox also said Republicans will not be in a position to win statewide elections without being better fundraisers. His loss was expected and some fellow Republicans talked through his ballroom speech, at times making it hard to hear the candidate from some parts of the room. San Diego Unified is set to get another multibillion-dollar cash infusion with the passage of Measure YY. San Diego City Councilman David Alvarez, once a rising star in the Democratic Party, its endorsed candidate for mayor in 2013 and a favorite of labor, could very well lose the Community College District seat he sought. He had already planned to run for county supervisor, and begun raising money for that seat, when he bizarrely jumped into the Community College race. Sean Elo had 50.7 percent to Alvarez’s 49.3 percent early Wednesday. Voters overwhelmingly approved Measure L, which will set in motion major salary increases for San Diego’s mayor and City Council. County voters also appear to have approved Measure D, which will change the way the county does elections. Now, all county offices – sheriff, district attorney, supervisor, etc. – will have to go to November runoffs no matter how well any one candidate does in the primary. This is thought to be a great advantage to Democrats. The current district attorney, sheriff and assessor all won their races outright in June. Under the new rules, they would have had to run this week as well. Voters also supported Measure H, which would put term limits on members of the San Diego Unified School District Board of Education. Our reporters fanned out across the county Tuesday to speak with voters about what motivated them to hit the polls. In Barrio Logan and San Ysidro, voters told us their vote in the District 8 City Council race was deeply personal — either they had actually met one of the candidates, or they knew enough about their work in the community that they felt like they knew them. In southeastern San Diego, where the District 4 City Council race overlaps with the District 4 county supervisors race, voters were split between wanting to hear a new perspective from Monica Montgomery, and valuing City Councilwoman Myrtle Cole’s experience. In North County, voters were eager to weigh in on the 49th District congressional race, which could help determine which party controls the House. And in the beach communities, voters were confused right up until the last minute about the competing plans to remake Mission Valley. Inevitably, there will be some California races that won’t be decided until long after Wednesday. CALmatters does a good job breaking down the reasons why — for example, California accepts mail-in ballots postmarked on Election Day, not just those received on Election Day. Voters who register on Election Day have to cast provisional ballots, which are counted if they are cast by eligible voters. California, 14 other states and the District of Columbia allow Election Day registration. And though there could certainly be errors and failures, this thread from Los Angeles Times’ John Myers offers a reminder that delays in finalizing certain vote counts aren’t necessarily a bad thing. “No state has as many voters as California. Most states don’t have as many voters as LA County or Orange County. Add in our pro-voting laws and a lot of paper ballots (the state moved decidedly away from wide use of touchscreens in 2006) and you get … a long count,” he writes. VOSD Podcast hosts Scott Lewis, Sara Libby and Andrew Keatts recorded a special election night podcast where they talked about the biggest surprise results so far, how their election fantasy draft picks fared and more. The Morning Report was written by Sara Libby and Ry Rivard.